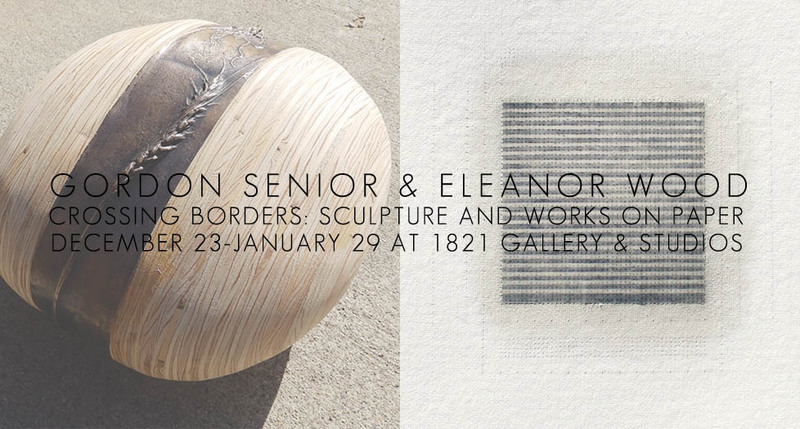 1821 Gallery & Studios is pleased to present Gordon Senior & Eleanor Wood’s new exhibition: Crossing Borders: Sculpture and Works on Paper. The show will run December 23- January 29. The major themes running through Gordon Senior’s sculptures identify frozen moments in time, significant pauses in the migratory passage and the wild or domesticated grasses and grains that have become part of our staple diet. These are explored through various contrasting materials such as wood, alabaster, cast plaster, laminated plywood and bronze. His drawings contain differing images, both man made and natural, such as trees and tools, placed in a particular landscape space. Senior uses collected earth to stain the paper in these works and then superimposes the printed image, drawing or watercolor. Where Gordon Senior’s work deals with specific places Eleanor Wood’s work is abstract. Works in this exhibition are on paper and the working procedure is obsessive, the paper being worked initially from the back and then built up in layers underneath the face of the work. When working on the ‘underneath’ layers she is planning for, and thinking about, how the concluding image on the surface will eventually be. The first thing, and usually the only thing the viewer sees is the surface, but the other layers, though barely visible, not only exist but are essential. You see one thing but other hidden layers exist. This relates to the history of the work and to notions of time and sequence. We live in a world where screens dominate almost everything, and are becoming unaccustomed to looking beneath for evidence of what existed before. Gordon Senior and Eleanor Wood are two British artists who have been living in the Central Valley since 2002, spending some time each year at their home in the UK. Senior is a professor at CSU Stanislaus and was the Art Department Chair for eight years. He has an exhibition at the Carnegie Art Center in Turlock during January 2016 and had work included in the Crow Show in San Diego earlier this year, as well an installation in Cley 15 Contemporary Art Exhibition in England this Summer. Eleanor Wood recently exhibited in the London Group Open Exhibition where she was a prizewinner and has an essay on her work by Professor David Olivant included in the “Drawing: Theory, Research Practice publication this month.